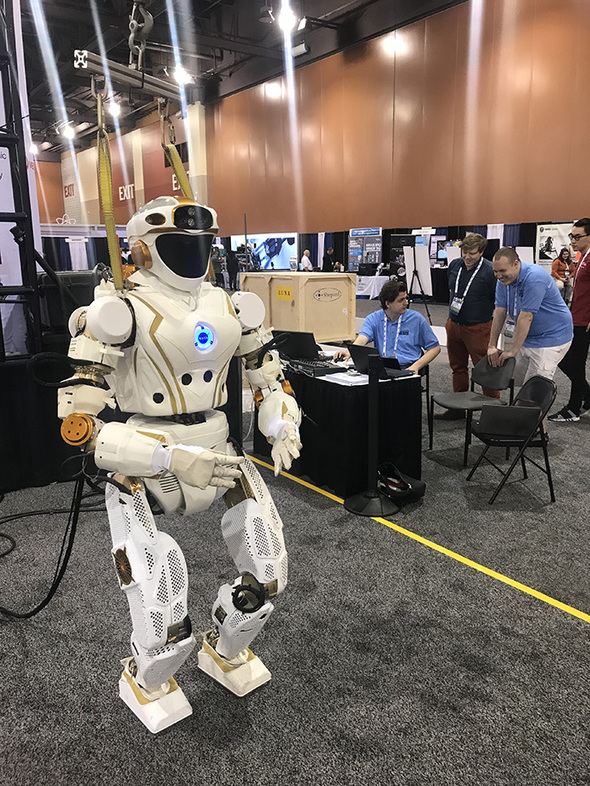 Featured at the Waste Management Symposia 2018 in Phoenix, the NASA Valkyrie weighs 300 pounds, and stands 6 feet, 2 inches tall. While EM is many years from using a humanoid robot, Valkyrie’s highly dexterous arms could replace gloves in EM glove boxes, making work easier and safer for laboratory technicians and workers. Tele-operated robotic arms and manipulators could provide key advances in glove box and hot cell design and operations. NASA and EM have been partnering on this and other robotics projects for more than 2 years. 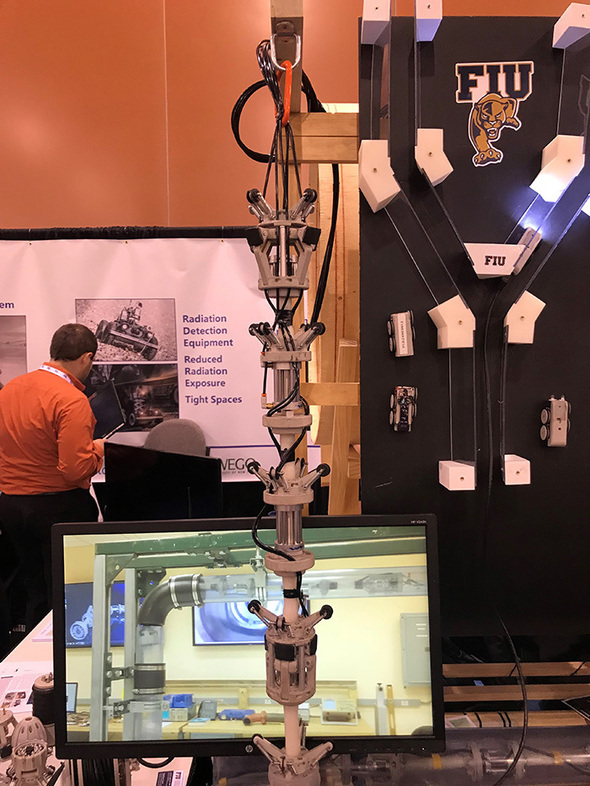 On display at the Waste Management Symposia 2018, the Gemini-Scout from Sandia National Laboratories is a robotic system that could support mine rescue teams. 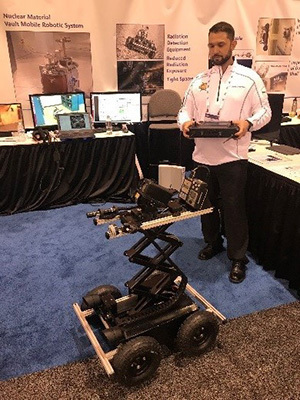 Equipped with cameras and sensors, it can provide feedback to first responders and serve as a two-way communications device with trapped miners while providing critical lifesaving information. The High Consequence Automation and Robotics (HCAR) group at Sandia developed the robot. The concept would allow for exploration and assessment of mine conditions ahead time. The Pipe Crawler, which can be activated by a smart phone, can travel through the air supply line that leads to the central plenum of the tanks at Hanford. 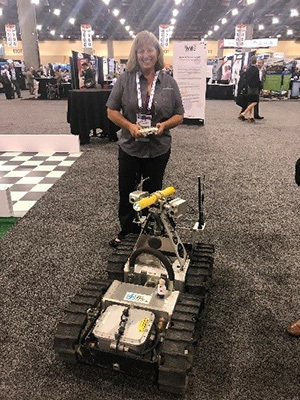 This robot, featured at the Waste Management Symposia 2018, provides information regarding the health of the tank floor around the center of the tank. The crawler’s movement mimics that of an inchworm and can navigate through several 90-degree elbows, reducers, and vertical runs. It also houses a camera for video feedback. The Robotic Rabbit was on hand at the Waste Management Symposia 2018. It was designed, built, and deployed at Exelon Generation, Nine Mile Point Nuclear Generating Station, in collaboration with the State University of New York Oswego. The goal was to create a simple-to-operate, easily modified, remote surveillance unit that can reduce collective radiation exposure to workers, obtain particulate air samples, and perform surveillances in high heat areas in search of steam leaks. The Sandia Hand, developed by Sandia National Laboratories, is low-cost, dexterous, and modular, enabling it to support a variety of applications including glove box manipulation, search and rescue, casualty care, and explosive ordnance disposal. 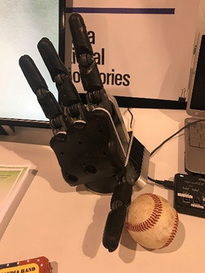 The hand, shown at the Waste Management Symposia 2018, consists of a frame that supports a set of identical fingers that magnetically attach and detach from the frame.